Healthcare-acquired infections cost billions of dollars. ICWUSA mounts may help promote infection control. 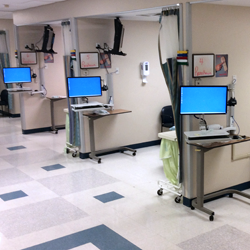 As part of their infection control plan, facilities need computer mounts that streamline cleaning and withstand rigorous disinfection. Healthcare-associated infections represent a major threat to patient safety. About 90,000 patients with HAIs died during their hospitalizations. More than half of all HAIs occurred outside of the intensive care unit. Dialysis Centers: Hemodialysis patients are at a high risk for infection because the process of hemodialysis requires frequent use of catheters or insertion of needles to access the bloodstream. Central line–associated bloodstream infections add an average of $45,814 to a patient’s medical bill. The average cost of ventilator-associated pneumonia is $40,144 per case. Surgical site infections run $20,785. Clostridium difficile infections can cost $11,285. Catheter-associated urinary tract infections average $896 per case. Infection control is crucial. Environmental cleaning is a top priority. All healthcare settings must make infection prevention a priority and must be equipped to observe Standard Precautions of the CDC and HICPAC recommendations. Housekeeping surfaces require regular cleaning and removal of both gram-positive cocci and gram-negative bacilli. The necessary first step is to clean with a surfactant or detergent and water, which removes organic matter, salts, and visible soils that interfere with microbial inactivation. After initial cleaning, surfaces must be thoroughly disinfected to eliminate pathogenic microorganisms. ICW’s tough, easy-to-clean finishes withstand harsh chemicals. ICW mounts are built with smooth, durable aircraft grade aluminum that doesn’t allow microorganisms to hide. Enclosed wires and internal components enable more thorough sanitization. Unlike carts, which can spread contamination when rolled from room to room, ICW mounting arms are confined to one room, can be easily disinfected, and reduce the risk of spreading infection. 1. CDC At Work: Preventing Healthcare-Associated Infections. 3. Centers for Disease Control: National and State Healthcare-Associated Infections Progress Report, 2016. 4. Infection Control Today. SSI Prevention: Crossing Environments of Care, Standardizing Incision Management. 6. The Journal of the American Medical Association: Study Estimates Costs of Health Care-Associated Infections, 2013.